Big screen superhero movies bring characters to life largely thanks to a combination of digital and practical effects. Real people can’t do what superheroes can do, after all. However, that doesn’t mean the actors don’t work hard to be able to bring all they can to the role. Brie Larson is, very soon, going to join the pantheon of theatrical heroes, and she recently shared a clip of her training, that involved her pushing her trainer’s jeep single-handedly. Check it out. Brie Larson says the jeep weighs somewhere in the neighborhood of 5,000 pounds and just by looking at it you can tell that pushing this thing is not the same as pushing your average four-door sedan. It’s massive. It’s difficult to tell from the camera angle, but it’s also possible that Larson is pushing up a slight incline. Getting 5,000 pounds going from a dead stop would be a task even on level ground. Larson calls this moment a training highlight and it’s not hard to see why. Doing something like this was probably never something she even considered being able to do, and possibly could not do when her training for Captain Marvel began. Eventually, however, her trainer Jason Walsh helped her build the muscle necessary to pull off a massive feat like this one. 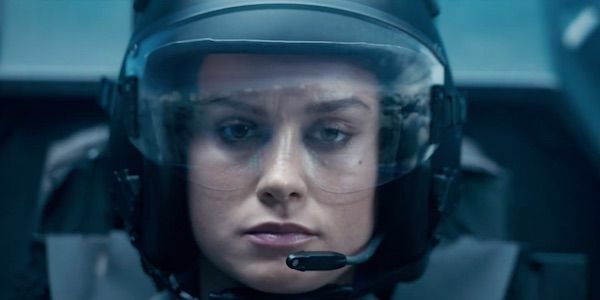 While Brie Larson still won’t be doing anything superhuman, this level of training is necessary to both make the actress look like a superhero, and also to get her in shape for some of the film’s action. While much of it might still be handled by stunt people, the production will likely want to use Larson as much as it can, and the better shape she is, the more she’ll be able to do on set. Captain Marvel is less than two months away and the next chapter of the Marvel Cinematic Universe will take us all back in time slightly to the 1990s. A time when Nick Fury had two eyes and nobody knew anything about aliens or magic or superheroes. This is all before she swoops in to save the day in Avengers: Endgame which is something we’re all expecting her to do to one degree or another. What the future holds for Brie Larson and Captain Marvel in the MCU going into the next phase is a mystery, mostly because we have no clue what the future holds for anybody in the next phase of the MCU. Movies will happen, we’re pretty sure about that, but exactly which ones, or when we’ll see them, are almost entirely conjecture at this point.